A wedding night gift basket for the bride and groom is a fun way to treat the newlyweds to a special treat and keep the wedding festivities going. Depending on your relationship to the couple and the couple's personality, you can personalize this basket to include anything you think they'll enjoy. Putting together a gift basket that you customize is a great way to show the bride and groom that you care. Most of the items you need to put together a perfect wedding night or honeymoon basket are readily available online or in major retail stores. With a little planning, you can create the perfect DIY basket for the new couple to enjoy. The bride and groom can use the candles and rose petals to decorate their room, creating an ambiance of romance. The food and champagne are affiliated with sensuality. Massage oil and edible body paint allow for some fun after changing into the seductive attire included in the basket. 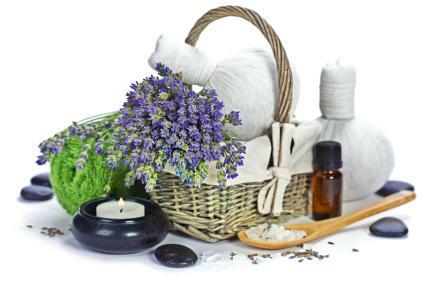 The items in this basket are all relaxation themed. The scent of lavender is linked to relaxation, and the pillow spray and candles will help envelop the couple in a room emanating calmness. Lavender-scented lotion can help soothe sore feet. 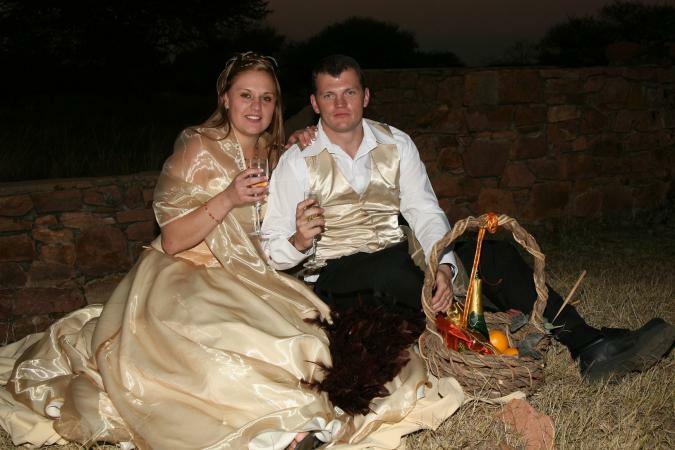 The snacks and tea are relaxing and delicious foods that will help the couple fill their late-night empty stomachs. Pajamas and soft socks put anyone in a calm mood. Add a few springs of actual lavender to the basket to dress it up for presenting to the couple. Personalized glasses with their monogram, names, or "Mr." and "Mrs."
The contents of this basket remind the couple of their best night ever and, to that end, many of its contents focus on the "best" parts of the evening. The glasses etched with their new initials or titles, bath towels, and t-shirts celebrate their new relationship while the journal, CD, framed invitation, and card reinforce the "best" theme. Snacks are included because most couples are hungry at the end of their long day. 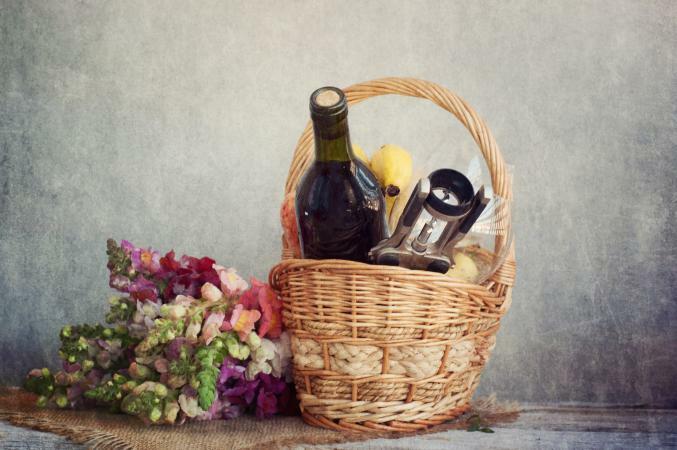 No matter its contents, the gift basket you create should be nicely presented. This requires using a basket deep enough to hold all the items you selected, perhaps in a color that matches either the theme of the basket or the wedding. For example, the Nice and Naughty Gift Basket might be red or black in color. The basket should contain some tissue or colored shredded paper in the bottom so that the contents stand up and are visible. If you are afraid of the contents falling out of the basket, you may choose to use clear plastic wrap to enclose the basket which can be found at most craft stores. All baskets should contain a bow at the top that matches the basket or its contents. Don't forget to include a card so the couple knows whom to thank for the gift. 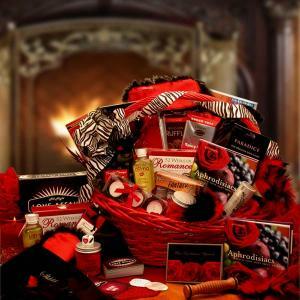 The Naughty Nights Couples Romantic Gift Basket offered by Hayneedle contains playful items. Its contents include nighttime games designed for couples, sensuous pillow spray, chocolate body paints, an aromatherapy candle, and a wooden massager. It costs approximately $135. The Happily Ever After Gift Box sold by the English Tea Store combines romance with memories of a couple's wedding. Its contents include snacks in the form of cookies, crackers, and truffles, as well as an inspiration book for the newlyweds, votive candles, and a gold picture frame to fill with a photo of their choice. It costs about $55. The White Dove Wedding Gift Basket offers a special selection of indulgent snacks for a couple to enjoy on their wedding night, along with other items that help them celebrate their marriage, like pretty votive candles and a wooden photo frame. The basket includes Champagne glasses, sparkling cider, lobster pate, crackers, vegetable spread, rich Camembert cheese spread, delectable olives, cheese twists, and sweet caramel nut clusters. It's available from Adorable Gift Baskets for about $120. 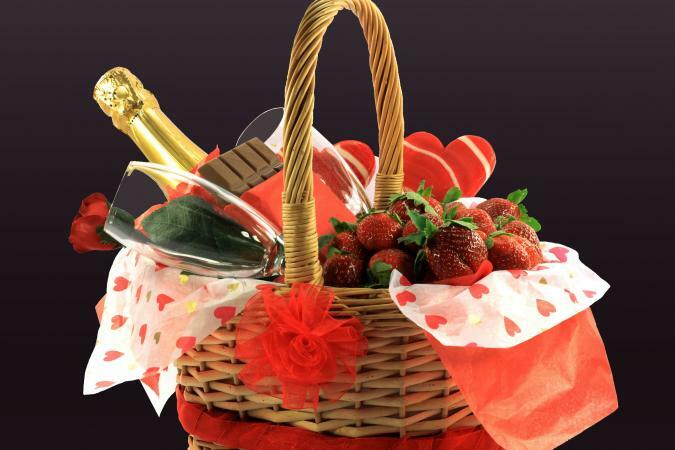 The Double Delight Gift Basket from Kiarna Vineyards offers a decadent gift of food and drink for the new couple. Wine is a classic romantic gift, and with this basket, you give the happy couple the best of both worlds with an enticing offering of both white and red wines. Along with a delicious Chardonnay and an elegant Cabernet Sauvignon, the couple will receive an assortment of snacks to indulge in, including Stonefire flatbread crisps, rich Asiago cheese spread, and delectable golden walnut cookies. It is available for about $50. Another gift idea is the Italian Dinner for Two from Gourmet Gift Baskets. This basket contains everything the couple needs for a delicious Italian meal - ideal for couples who had an afternoon ceremony and probably didn't stop to think about what to eat for dinner. Two bottles of wine are accompanied by pasta, sauce, and all the fixings including biscotti for dessert. Delivery requires a signature from a recipient age 21 or over because of the alcohol. The basket costs around $160. Wedding night gift baskets can be a fun and romantic gift for a newlywed couple to enjoy. From pampering gifts to intimate indulgences, there are many options for creating a tasteful and thoughtful gift that a couple can enjoy during their first few hours of being husband and wife.